The plaques on Library Way across from the main branch of the New York Public Library grab quotes from history, famous literary works and from the lion of literature — the authors. Alfred Kazin's quote is different. 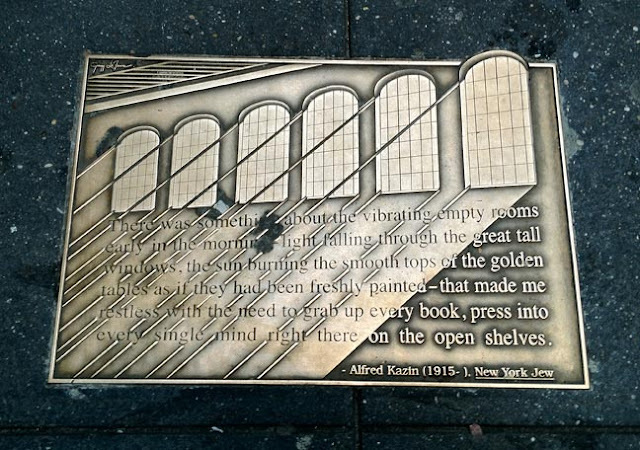 Kazin's quote is of the library itself. Room 315 in particular — the Main Reading Room. It was there as a young man in the Depression where he wrote his first book, On Native Grounds, published in 1942. In his memoir, New York Jew, published in 1978 Kazin looked back fondly at his time in the New York Public Library. Room 315 was not just a place to write. It was a place to observe and stir his imagination. While his plaque on Library Walk captures some of that "something" it is but one sentence of a bigger picture. I liked reading and working out my ideas in the midst of that endless crowd walking in and out of 315 looking for something; that Depression crowd so pent up, searching for puzzle contests, beauty contests, clues to buried treasure off Sandy Hook; seeking lost and dead and rich relatives in old New York, books of genealogy and Pittsburgh telephone books. I must have looked as mad to them as they did to me: jumping up with excitement and walking about the great halls as I discovered that just for the asking I could obtain all the books anyone would ever want to read by William Dean Howells, Henry James, Stephen Crane, Joseph Kirkland, Robert Herrick, Ed Howe, Henry Blake Fuller, Frank Norris, Theodore Dreiser, Jack London. I could read the mind behind each book. I felt connected with the text. There was some telepathy working between me and the invisible person, the omnipresent mind, that had put down these words. I was hungry for it, hungry all the time. I was made so restless by the many minds within my reach that no matter how often I rushed across to the Automat for another bun and coffee, to fuel up at those stand-up tables for New Yorkers too harried to eat their food sitting down, I could never get back to my books and notes, “BACK SOON, DO NOT DISTURB,” without the same number of pains tearing me inside. Born and died on the same day, Alfred Kazin came into this world on June 5, 1915 and passed in 1998. The Dean of American Criticism wrote from the heart but his opinions were formed by his knowledge of the world around him. Two years before his death he was awarded the first Truman Capote Lifetime Achievement Award in Literary Criticism. The award has only been presented once more in the last 20 years. Whether it be a birth day, anniversary or publication date of a seminal work, the Bar None Group will revisit these 40+ quotations from time to time — quotations that inspire one to write, read, explore and embrace literature. We last visited Julia Alvarez.